Gamers in India get another reason to rejoice as the Computer Entertainment branch of Sony released the 4th instalment of the popular PlayStation gaming consoles in the country earlier today. The console, to be used with an external display, is priced 39,990 INR for the Indian market. “It is an exciting time for all of us at PlayStation and after the successful launch across United States and European markets, we are putting in all our energy behind a successful introduction of the PlayStation 4 to the Indian consumers. It is quite overwhelming to see the unprecedented demand for PS4 across the world and amongst the Indian gamers,” is what Atindriya Bose, Country Head – PlayStation India had to say at the launch of the gaming console. The console will come with what Sony call a ‘Supercharged PC architecture’, comprising of a GPU of unknown make, and 8 gigs of DDR5 RAM which would make any desktop gamer green in envy. The DUALSHOCK®4 controllers of the console come with a unique “share” button, using which images and videos can be shared with other players on their PS4 system. According to Sony, the PlayStation 4 integrates second screen devices like the PlayStation Vita, smartphones and tablets to connect users to PlayStation wherever they are. In other words, the PS4 can work with your small screen devices using WiFi which means your home TV can be used for other purposes as well, unlike previously when the TV was the only option. 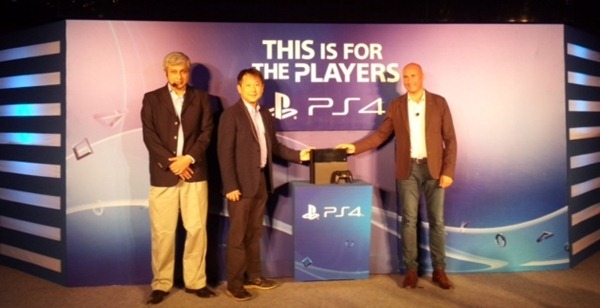 The PlayStation 4 is priced 39,990 INR and will be available in the country beginning 6th January 2014. Initially, at launch, console buyers will have a choice of 20 different titles to choose from. According to Sony, there will be more than 30 titles in all by the end of the year.